Over 1 billion people, or approximately 15 percent of the world’s population, have disabilities. While no global data exists regarding indigenous persons with disabilities, available statistics show that indigenous peoples are disproportionately likely to experience disability in comparison to the general population (see footnote 1). 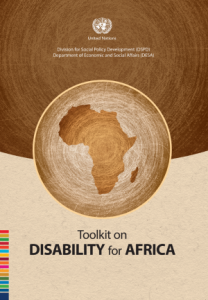 Indigenous persons with disabilities often experience multiple discrimination and often face barriers to the full enjoyment of their rights, based on their indigenous status and also on disability. Both the international indigenous rights and the international disability rights movements have achieved great advances in recent years. Notably, in 2007, following more than two decades of negotiation, the General Assembly adopted the UN Declaration on the Rights of Indigenous Peoples. In 2006, the General Assembly adopted the Convention on the Rights of Persons with Disabilities, which entered into force in 2008. While both movements have been active on the rights of sub-groups within their constituencies and although both the UNDRIP and the UNCRPD include protections for indigenous peoples with disabilities (see footnote 2), the rights of indigenous persons with disabilities have not been addressed centrally by either movement. To advance the rights of indigenous persons with disabilities, as well as their inclusion in development, it is essential that their perspectives be included in work on the rights of indigenous peoples, and that work on disability rights incorporate an indigenous perspective. This panel discussion, which will highlight the voices of six indigenous leaders with disabilities from the Global South, is intended as a step towards dissolving divisions between movements and promoting inclusion of indigenous persons with disabilities in the broader indigenous rights movement, as well as in the work of the UN system by, for and with indigenous peoples. Panelists will explore the complexities of an intersectional identity, as well as approaches to advancing the rights and inclusion in all aspects of development of indigenous persons with disabilities, particularly those in the Global South. By raising awareness on the situation of indigenous persons with disabilities, this meeting can also contribute to the mainstreaming of the rights of indigenous persons with disabilities into the broader development policy framework of the United Nations, particularly within two parallel processes currently taking place: the UN Conference on Sustainable Development (Rio+20) and initial discussions on a post-2015 development agenda. The panel can also contribute to the High-level Meeting on disability and development, to be convened by the General Assembly in September 2013; the World Conference on Indigenous Peoples, to be convened by the General Assembly in 2014; and to the 51st and 52nd sessions of the Commission on Social Development, which will focus on “Promoting empowerment of people in achieving poverty eradication, social integration and full employment and decent work for all”. What major challenges exist to the realization of human rights and inclusion in development for indigenous persons with disabilities in the communities you come from? What are the current links, if any, between indigenous persons with disabilities and the wider indigenous movement in your country? What role have indigenous organizations played and what actions can they take to include indigenous persons with disabilities in their work? What key factors have contributed or could contribute to overcoming challenges, including the challenge of linking social movements? Are there specific cases or examples of strategies or approaches that can be shared in this regard? Also, what role have indigenous persons with disabilities played in addressing the challenges confronting them? How can the UN System entities, including the Permanent Forum on Indigenous Issues, best support the empowerment of indigenous persons with disabilities, the realization of their rights, and their inclusion in development policies, programmes, monitoring and evaluation at all levels? How can Governments, UN entities and organizations of indigenous persons with disabilities work together and build partnerships that will provide sustained and sustainable support for the empowerment of indigenous persons with disabilities? What role have indigenous organizations played and what actions can they take to include indigenous persons with disabilities in their work? What additional activities can further support organizations of indigenous persons with disabilities? Panel discussion to be followed by a question and answer session. This side event is organized by the Disability Rights Fund in collaboration with the United Nations Department of Economic and Social Affairs, and with the sponsorship of the Government of Australia. Footnote 1: For example, in 1991 over 20 percent of Canada’s indigenous population aged between 25 and 34 reported a disability, the rate going even up to 30 percent concerning the people aged between 34 and 45 (See www.statcan.ca/english/studies/82-003/archive/1996/hrar1996008001s0a02.pdf). In the United States 20,7 percent of all Native Americans and/or Alaska Natives aged 16 to 64 reported a disability in 2007 (See: http://www.ilr.cornell.edu/edi/disabilitystatistics/acs.cfm), while in 2002 over one third of Australia’s Aboriginal and Torres Strait Islander people aged 15 years or older reported a disability or long term health problem, spread relatively evenly over remote and non-remote areas. (See http://www.healthinfonet.ecu.edu.au/health-facts/overviews/disability ). Footnote 2: The Declaration calls for specific attention to be paid to the rights and special needs of persons with disabilities, including in measures taken by States to ensure continuing improvement of economic and social conditions for indigenous peoples (UNDRIP, Article 21(2) and 22(1)). Non-discrimination is a core principle of the CRPD.